Former attorney-general George Brandis says he expects there will be no children of refugees and asylum seekers on Nauru by the end of the year. More children have been transferred for treatment, with Government sources confirming there are now 40 on the Pacific Island — down from 52 last week. The Australian newspaper is reporting that all the children will be transferred off the island by the end of the year. The Federal Government is refusing to confirm that timeline but Mr Brandis, who is now High Commissioner to the United Kingdom, says it is a reasonable expectation. I guess there's nothing like being thrashed in a by-election to focus a government's mind. But while this is good news, its only part of the battle: the Australian government needs to free its adult detainees as well as the children. 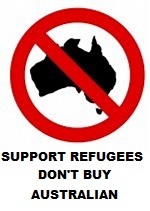 And until they do that, and close down their concentration camps, you should not buy Australian.